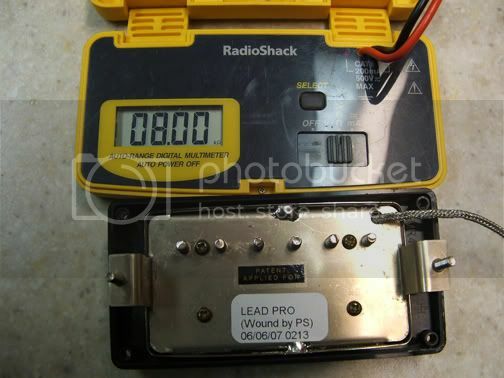 OK, first, let me stress how important preparation is for this kind of electronics install. This isn't something you can do an hour before a gig. Rubber or Plastic Tubing. I use aquarium air-hose tubing. 50ft/$2.50 at WalMart in the pet section. Cut 4 pieces of 3-ft-long each. A 1/4" plug. Cut this sucker off, and jam the 1/8" dowel rod in the end of it. SuperGlue might help make it more sturdy. A hex-nut. The kind that goes on the pots. 6 ft of scrap wire, cut into 3-ft lengths. A shoelace. The thinner, the better. Towels, cloth or paper. Lots of them. I prefer cloth, but you have what you have. To start, you gotta get the old harness out. 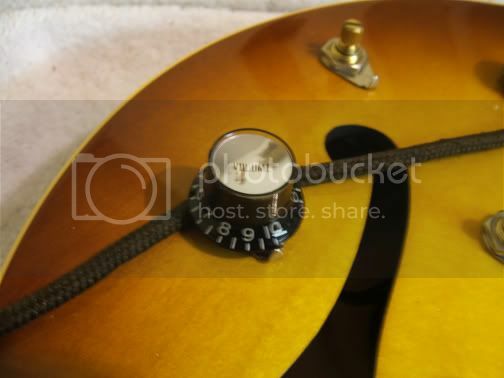 But first, before you go tearin' into the guitar to get the pot harness out, >think<: what could impede my progress? Yes, the ground wire. 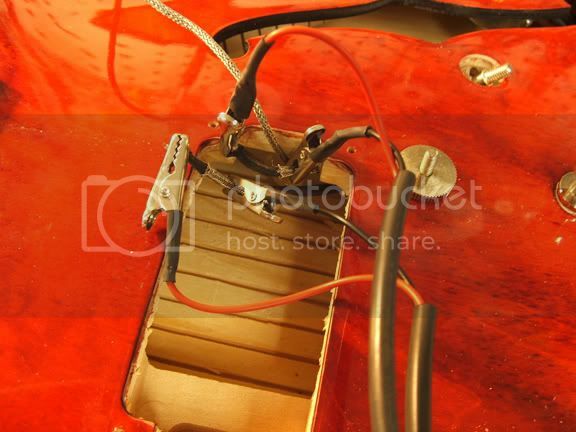 The ground wire is commonly soldered on the metal braid of the Bridge pickup lead. So, in my experience, it is best to remove this first. 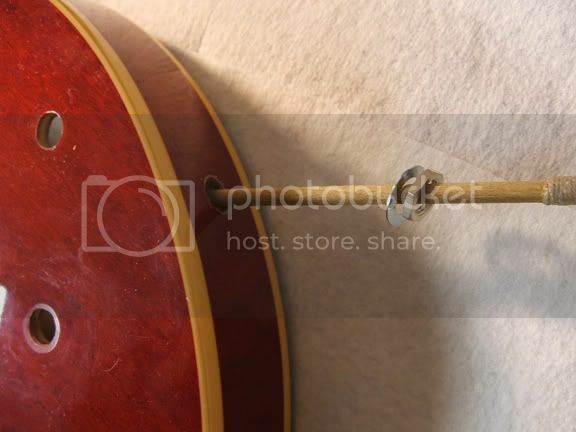 It is wrapped around the braid, and soldered on good, so you'll have to carefully apply your iron to melt the solder around the ground wire and kind of twist the pickup away from the ground wire. Easy to type, tricky to do in real life. 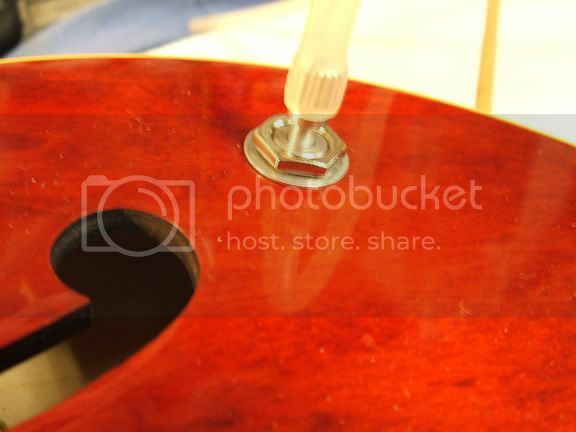 Make sure you put your towels down on the top of the guitar so you don't accidentally drip solder or burn the top of your guitar with the soldering iron. Once you get the knobs off, loosen up the hex-nuts and the jack, and collect the nuts & washers and set them aside (don't lose them). It will take some manipulation, but you can gently manuever the whole harness out. 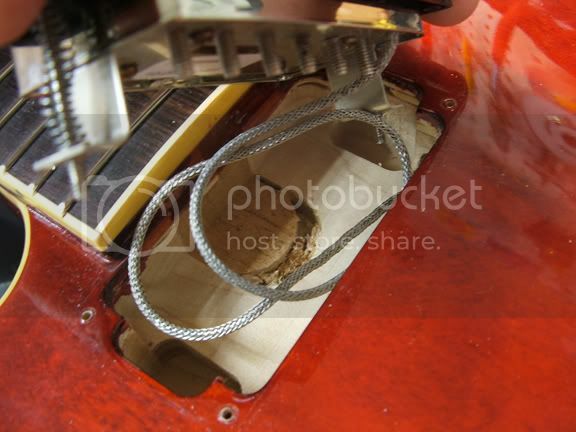 You are now posed with a new dilemma: unsoldering the pickups from the Volume pots. "HA!...I can do that..." you say. 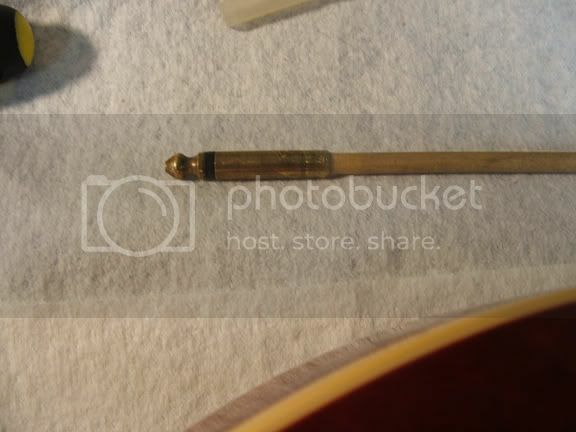 If you've gotten this far, you can remove the Bridge pickup and set it aside. Don't lose it, you will need it later. I like to leave the Neck pickup in the guitar--no real reason to remove it, but I tape its lead down with masking tape. 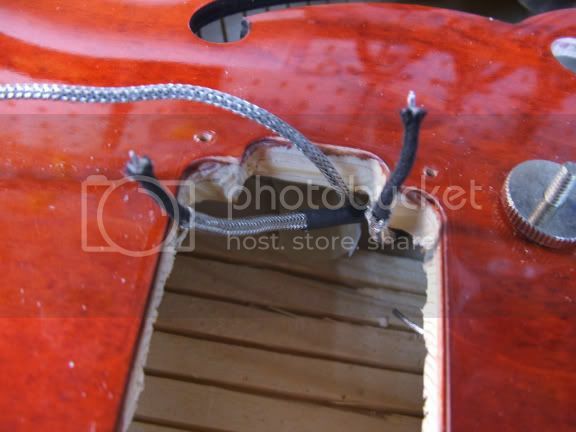 Unless you are changing out your pickups, then go ahead on with taking it out. 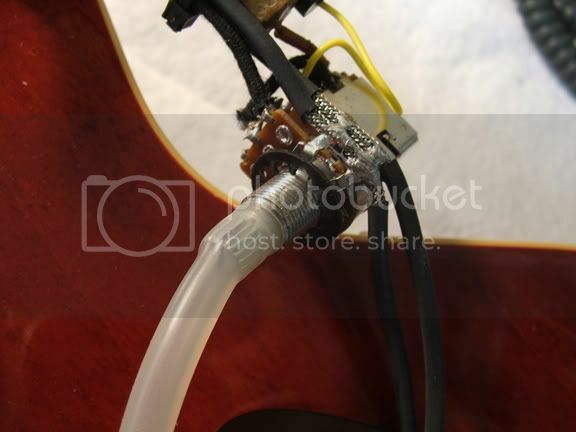 For this reason, every pre-wired RS Guitarworks 335 harness is tested at the shop, by me, to make sure that the Switch, Volumes & Tones all work like they should. 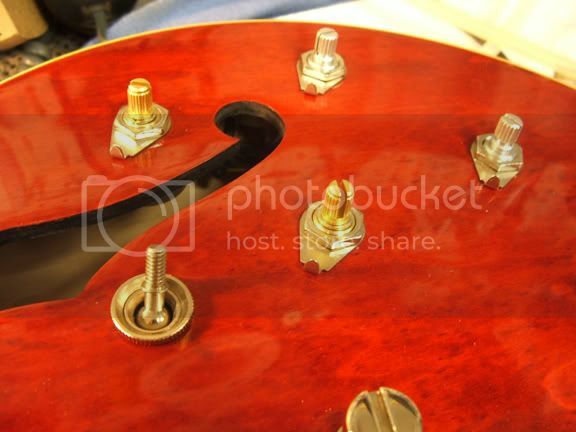 Solder leads to the Volume pots to extend the lengths up towards the Bridge pickup route. 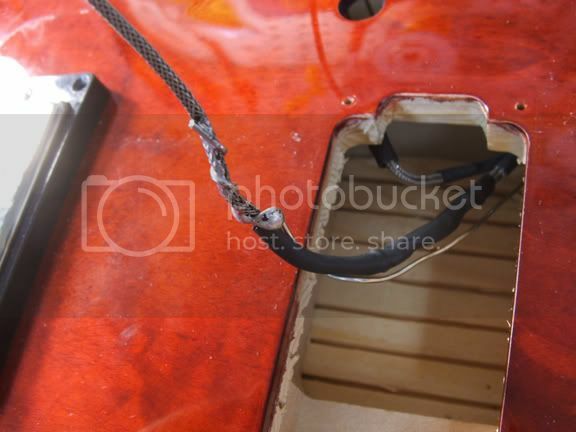 On my pre-wired 335 harnesses, I put "extention" leads on. Why? 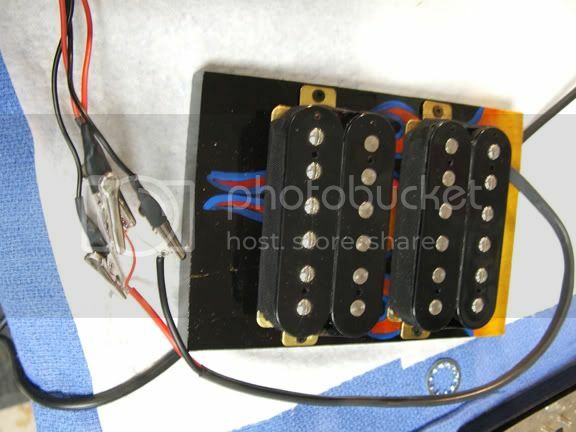 So that if someone feels "experimental", they won't have to spend all freakin' day just to change out some pickups...the leads are right there--just solder the pickup's leads onto the extentions from the Volume pots. Again, I learned this from experience...just trying to save some headaches. 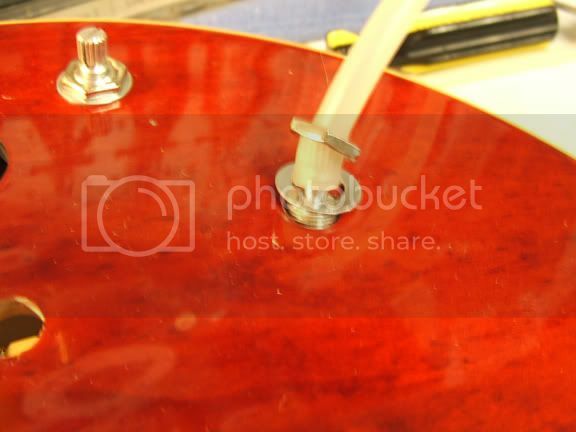 If you decide to solder the pickups directly to the Volume pots, make sure you ground them to the back of their respective Volume pot. 1. You've tested the harness. 2. 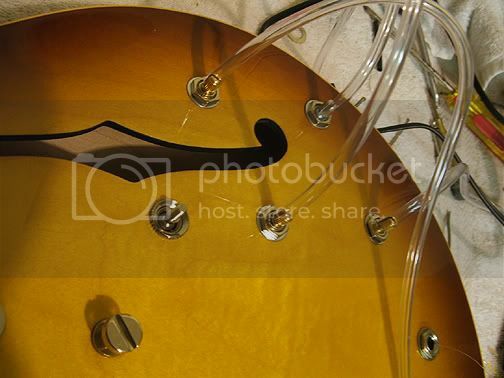 You've got the pickups hooked up to the Volume Pots, and grounded to the back of the Volume pots. 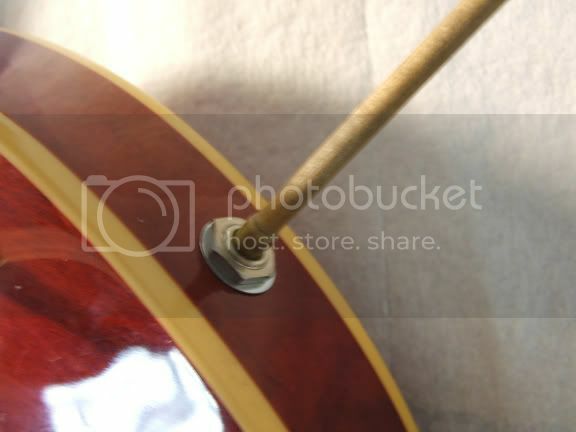 If you have the jack on the bottom/side of the guitar body, time to get your Reachin' Stick/dowel rod with the jack plug on it. Put the flat finish washer on the stick. Put the hex nut on the stick. 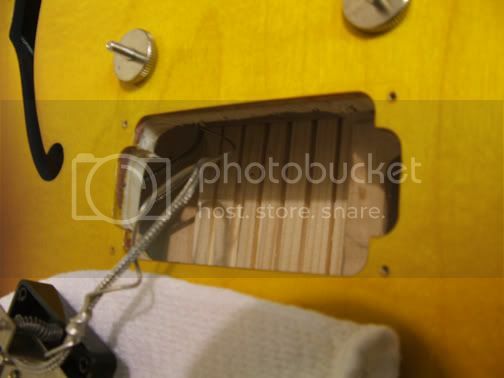 Fish the Reachin' Stick (with the washer & nut on it), through the hole for the jack, towards the Bridge Pickup route. Plug the plug into jack of the harness. 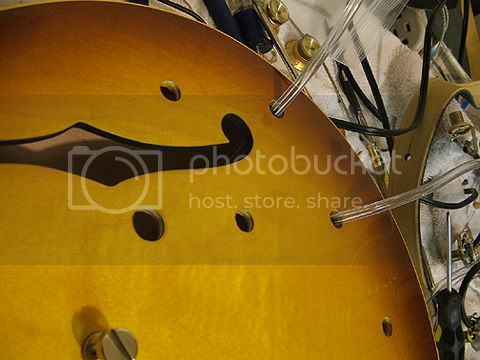 You will use the Reachin' Stick to pull the jack through the side of the body, with the lock/'star' washer on the jack, and be able to screw the hex nut on top of the flat washer, all in one motion. If your jack is mounted on the top, then you have to get inventive. 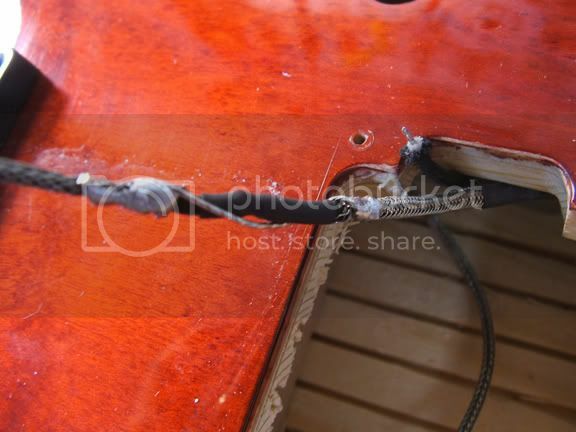 My way was to fish a long piece of scrap wire through the jack's hole in the top, and get it to the Bridge pickup route. 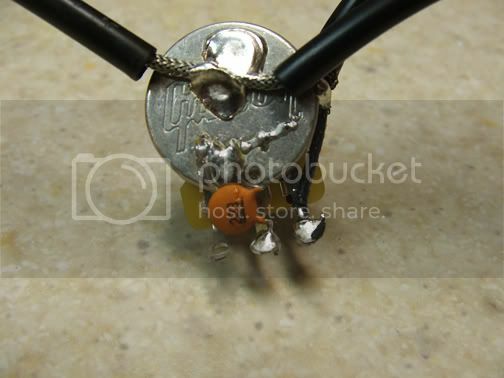 I then put a lock/'star' washer on the piece of wire, and let it fall down on the wire, inside the body. I then ran the wire right through the jack (like a plug), out the back and gave myself a few inches of slack. I then tied a spare hex-nut onto the end of the piece of wire, so it is behind the back end of the jack. Next, tie the other 3-ft or so length of wire to the hex-nut, so it is hanging out of the Bridge pickup route and outside of the guitar. When you pull the wire out of the hole for the jack, the jack should be pulled right into the hole, using the spare hex-nut behind it as leverage. Slip the finish washer & nut on the top, finger-tight. 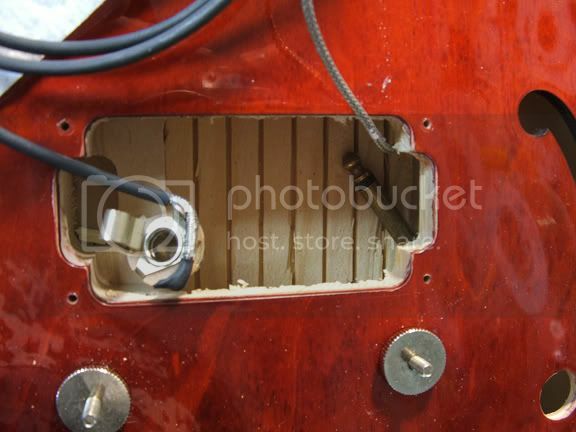 Then, use the other length of wire to pull the hex-nut & wire assembly back out the Bridge pickup route. 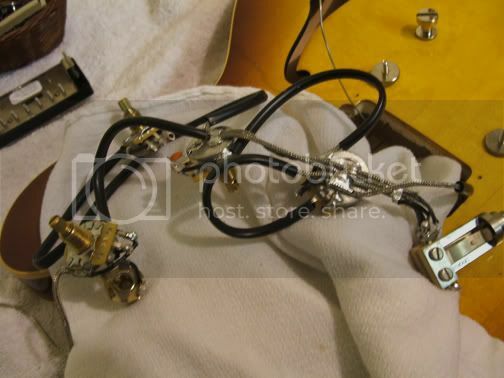 Pull each individual piece of tubing up through the Bridge pickup route, and put a lock/'star' washer over the end of it. 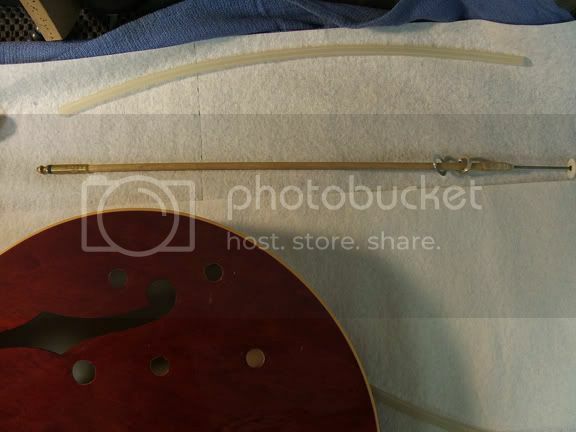 Then, attach each piece of tubing onto the matching pot's shaft, taking care not to cross the pieces of tubing. 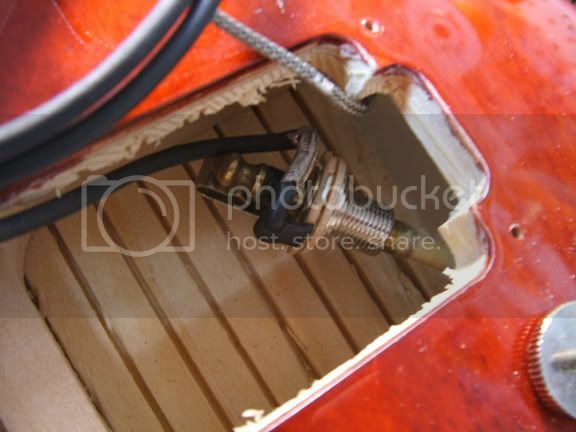 The goal here is to pull the tubing (with the pots attached) in a straight shot from the under-side of the guitar, up through the pot holes easily. 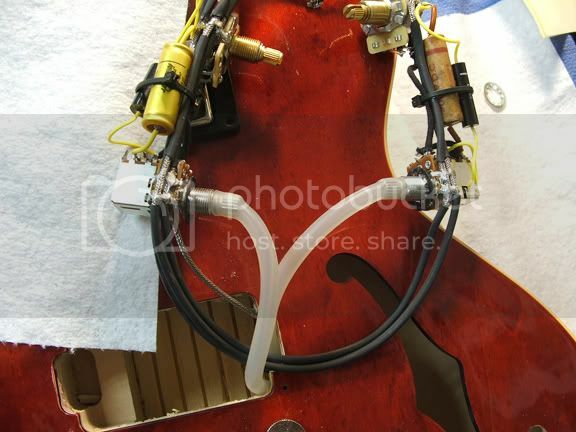 Get the whole harness (semi-organized) into the body of the guitar. Jack first, followed by the Tones, and then the Volumes & Switch. This may take some effort, but you're almost done. Time for a very important part: Test the harness again. Make sure the switch, Volume & Tone controls do what they are supposed to do by tapping on the pickups. If everything is good, tighten everything down. 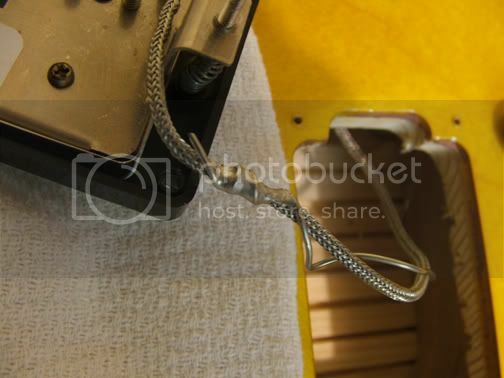 Re-attach the ground wire to the braid of the Bridge pickup. Or, if your Bridge pickup doesn't a metal braid lead, you can solder the bridge ground to the back of the pickup...or you can loop it underneath the pickup height adjustment spring & screw. You are done. Have an Adult Beverage or 3 of your choice. If you have a problem, you are still at a point where you can troubleshoot. Pull the harness back out, with all the tubing attached. Start with pieces of wire inadvertantly touching other pieces of wire or legs of pots. Bad grounds. Cold solder joints. This is why I heat-shrink everything. 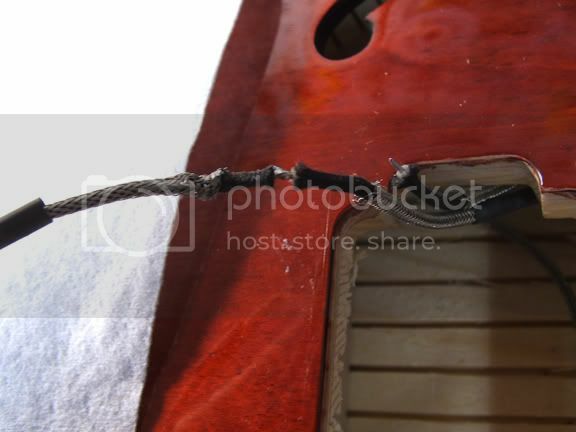 This is why testing the harness outside the guitar is so crucial. There are hard-learned lessons. I think this post will save a lot of people headaches, time, and money on Advil. Just wish I could've read it a few years ago! Great article, Billy. Thanks so much, on behalf of 335 players everywhere! Awsome awsome post. 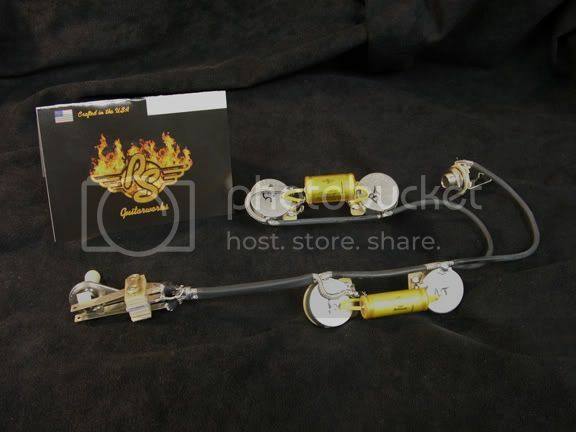 Is there anything like this for the les paul? This is excellent, Billy! I know because I've done this a couple of times. 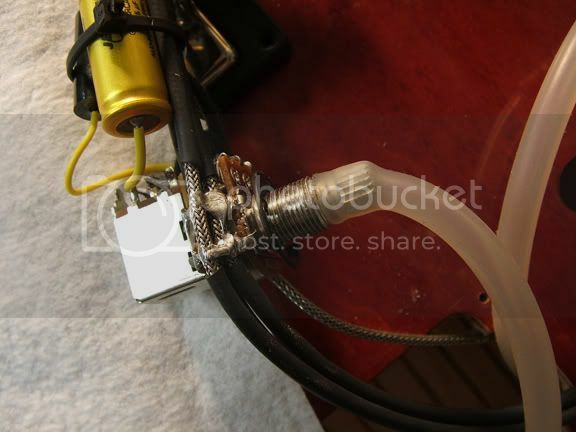 A tip for input jacks that are mounted on the top: take a 1/4 " jack that's grinded down on the sides so it fits through the hole in the top and solder some length of unused cable to it. You can then push it through the hole, plug it into the jack and pull the jack right to it's place and back through the hole. 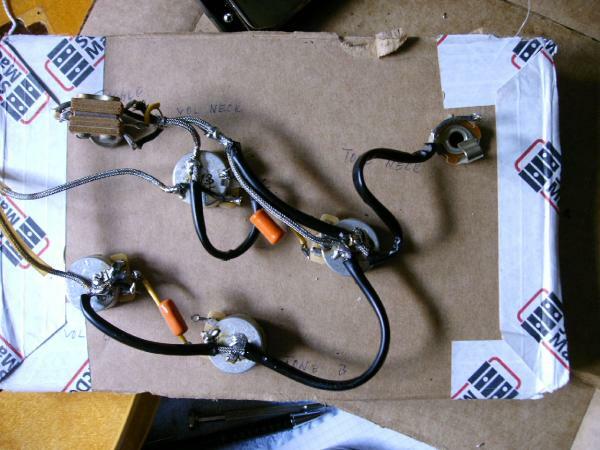 For those who don't use prewired assemblies: make a cardboard template to make all your connections pre reinstallation so you can be sure every piece of cable etc. will be of enough length. I've used heat shrink tube rather than the rubber tubing. DON'T use heat shrink with adhesive in it. Push over the shaft of the pot, hit it with a lighter, and it's on there tight. 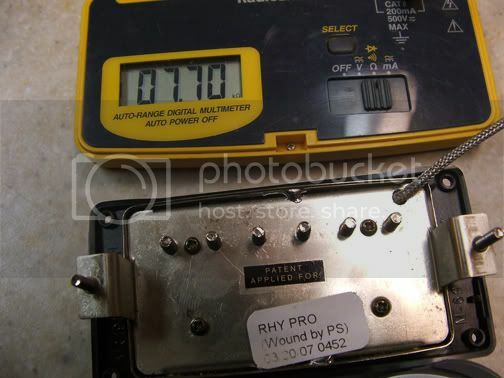 Pull them through, drop the washer/nut over the end of the tube, tighten it up, then a small cut in the tube removes it. Billy, What guitar were you using for your demo pics? 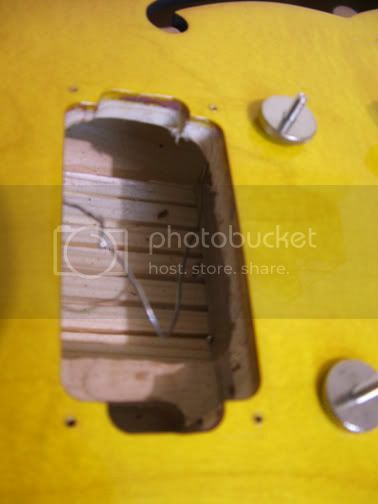 That pickup cavity is very spacious to say the least. Just last week I did a Tokai ES 120 (335 copy) and the opening was less tha an inch. I could barely get the new CTS pots in sideways one at a time. What a PITA! Besides Billy's great directions, I also recommend that you allow yourself plenty of extra time to complete the job. A job like this that is not rushed seems to go a lot smoother. You are quite a resource and we are lucky to have you on the forum! Thanks! This 339 is über-thin, so working the push/pulls up-&-into the control holes was a bit of a challenge, especially since it was first-thing in the AM and I haven't even had 1/2-a-Mountain Dew yet. Did the Bridge pickup the same way, but I have to account for that pesky ground wire. So I left enough room for it, and once I soldered it on there, I used a mini-zip tie to bundle the Bridge pickup lead & the lead from the Neck pickup together so that you can't see any wires through the F-hole. Again, I hope this was helpful, sorry for the length and all the pics. Like I said a few posts above, preparation is the main thing here. The actual install is easy. 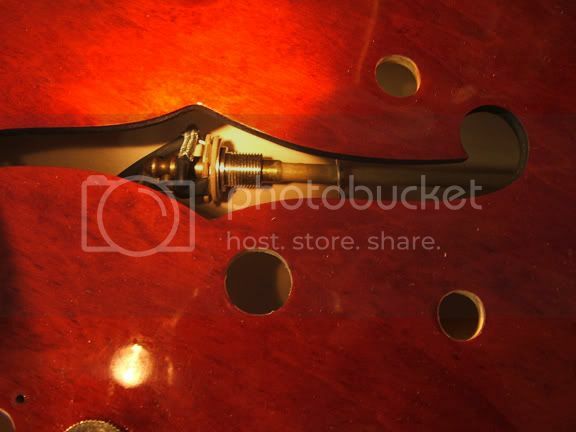 That guitar was my buddy's new 335 with block inlays, I think it was a 2008. Regular 335's, Gretshces, and the big jazz boxes are a piece of cake compared to some guitars. Luckily for me, that's what I had to work on today , and, as luck would have it, the customer wanted some special tweaks (which I was able to oblige), but it required the use of 2 push/pull pots. I think 339's are an 1-&-a-1/2-inch thick, and push/pulls are 1-&-a-1/4-inch, so there's little room for error. Given the thread here, I took a bunch of pictures along the way (see the above posts). Man. I wish this post was around last year. When I did mine. Nothing to add other than my thanks for such an informative thread. Cheers, hillbilly. I can see how the input jack might easily be the biggest nightmare to pull back into the body if the jack is on top, not on the side. Could the plastic tubing be used in this case? What if you took the plastic tubing, shoved the 1/4" plug into one end (or maybe just tape it up big time) and thread that through the hole? Would that work?